Botond 14 éves, Szekszárdon lakik és a pécsi Klinikán kezelik. 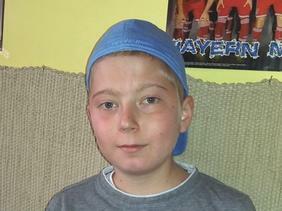 Botond (14) lives in Szekszárd and he is treated at the Pécs pediatric clinic. He would like to have a GO Pro Hero 4 Black or Silver sports camera as when he is at home and well, he likes to move around as much as any boy of his age. With the camera he intends to record his experiences and wants to show those to his fellow patients. Remélem, hogy sok jó felvétel készül majd.